At times, final scores may be deceiving. That certainly is the case in Eden Prairie's 4-2 victory over Benilde-St. Margaret's at the Eden Prairie Community Center on Saturday. Outside of an 11-second hiccup midway through the third period, the Eagles dominated play to claim the win. "That was one of our better efforts this year for sure," Eden Prairie coach Lee Smith said. 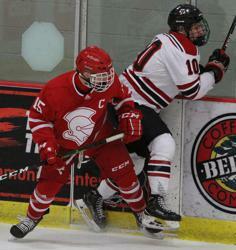 "We knew the Red Knights were a good hockey team that is well-coached and plays hard. But all of our guys showed up, both mentally and physically, and we played well as a result." Senior forward Jack Jensen, who scored two of the Eagles’ goals, said a bad loss at Stillwater motivated the Eagles. 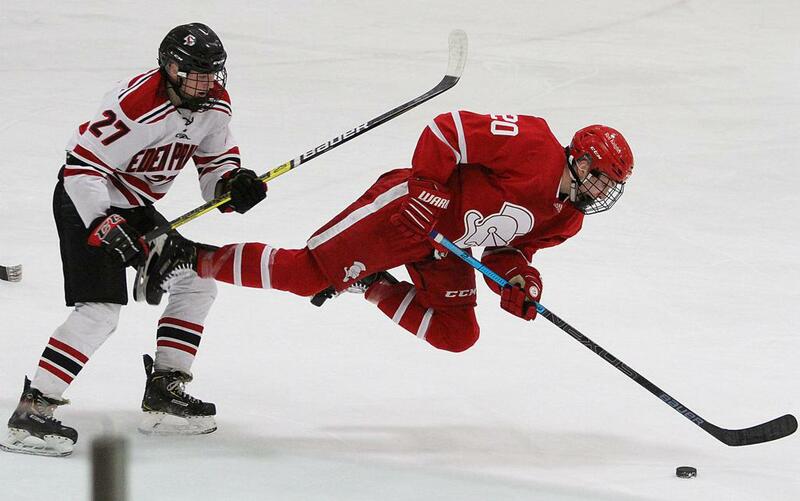 In that matchup, on Feb. 5, Eden Prairie lost 7-5 after giving up four third-period goals to the Ponies. "Everyone was going hard and playing defense, finishing checks well tonight," he said. "We were making clean passes, and our D was moving the puck up well to make our breakouts really complete." The Eagles, ranked No. 9 in the Class 2A state coaches' poll, also got goals from Sam Wilhite and Keegan Langefels in the victory Saturday. "There's a reason they are still ranked in the top 10 despite the losses they have," Benilde-St. Margaret's coach Ken Pauly said of Eden Prairie. "Everyone recognizes the schedule they play, and how good they are. That was seniors against freshmen tonight." And the difference-maker for the Eagles was one of those seniors: Jensen. "When our captain is leading and distributing the puck like that, it really goes down the lineup," Smith said of Jensen, who now has 29 goals and 19 assists in 22 games played this season. "Jack should be a Mr. Hockey candidate, and tonight he played like that. He was a man against kids out there." What Smith liked best about Jensen's was his unselfishness, which was best exemplified by a sharp passing play that led to the game's first goal, which came off the stick of Wilhite at 9:19 of the opening period. "Jack was willing to distribute — instead of worrying about scoring the goal, he was willing to share with his linemate," Smith said. "And when he had his chances, he put the puck on the net. He made the right play all night long." Jensen made the score 2-0 with 5 minutes, 33 seconds left in the opening period when Benilde-St. Margaret's goalie Carson Limesand came out of his net to try and handle a puck at the blueline. But Jensen got their first, skated around Limesand and netted his first goal of the night. "I didn't know the goalie would come out that far, because the puck was at the blueline," Jensen said. "But he did, and I didn't mess up." Pauly said that early deficit was too much for his young team, which is filled with sophomores and freshmen, to overcome. "With a high school team, you want to get off to a good start," he said. "With a young high school team, it's critical. For them to get two in the first period, and especially the way they got the second goal, really put us on our heels." Langefels scored just after a power play ended on a shot from the blueline at 5:14 of the second period, and Jensen made it 4-0 early in the third period with his goal with 10 minutes, 19 seconds left. "He's just a stud," Pauly said of Jensen. 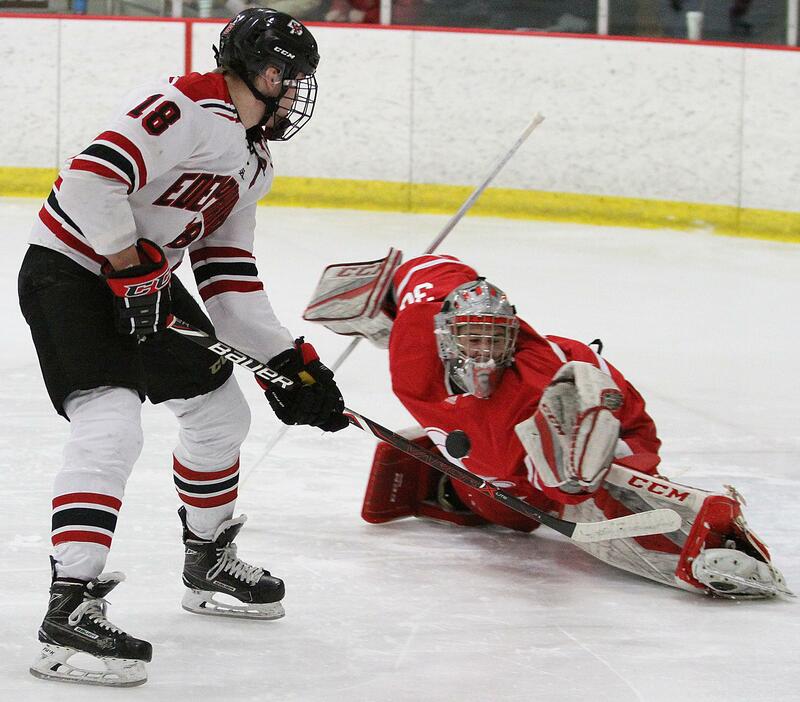 But there was a bit of nervousness for Eden Prairie (13-8-2, 2-3-0) in the waning moments as Benilde-St. Margaret's Blake Mesenberg spoiled Axel Rosenlund's shutout bid with a goal with 6 minutes, 8 seconds to play, and Charlie Bischel scored just 11 seconds later to suddenly make it 4-2. "We had a breakdown on the first goal," Smith said. "The second goal was mostly a bad-angle shot, and was unfortunate. But I like how Axel responded; he made some really big saves at the end of the game." The Red Knights (15-6-0, 3-1-0) used an Eden Prairie penalty to pull the goaltender and create a 6-on-4 advantage but they were unable to come any closer. "We were bummed about the first goal, and then it was suddenly 4-2," Jensen said. "We realized we had to play better D because we were slacking a little bit. And I was a little nervous after that penalty, but we killed it off." Rosenlund finished with 24 saves for the Eagles, while Limesand stopped 28 shots for No. 8-2A Benilde-St. Margaret's, which saw it’s five-game winning streak snapped. Pauly said the loss is a good thing for his team. "There's probably more value in losing the way we lost," he said. "At the end, we banged a couple in and really competed, but we only competed in those last six-seven minutes of the game. It's a little bit of a wake-up call. Eden Prairie's the type of team we're going to need to beat to get out of our section, so this is a loss we can really use." Jack Jensen scored a pair of goals to lead Eden Prairie to a 4-2 victory over Benilde-St. Margaret's at the Eden Prairie Community Center on Saturday evening. The Eagles, ranked No. 9 in the Class 2A state coaches’ poll, soared to a 4-0 lead through the first two periods of play. 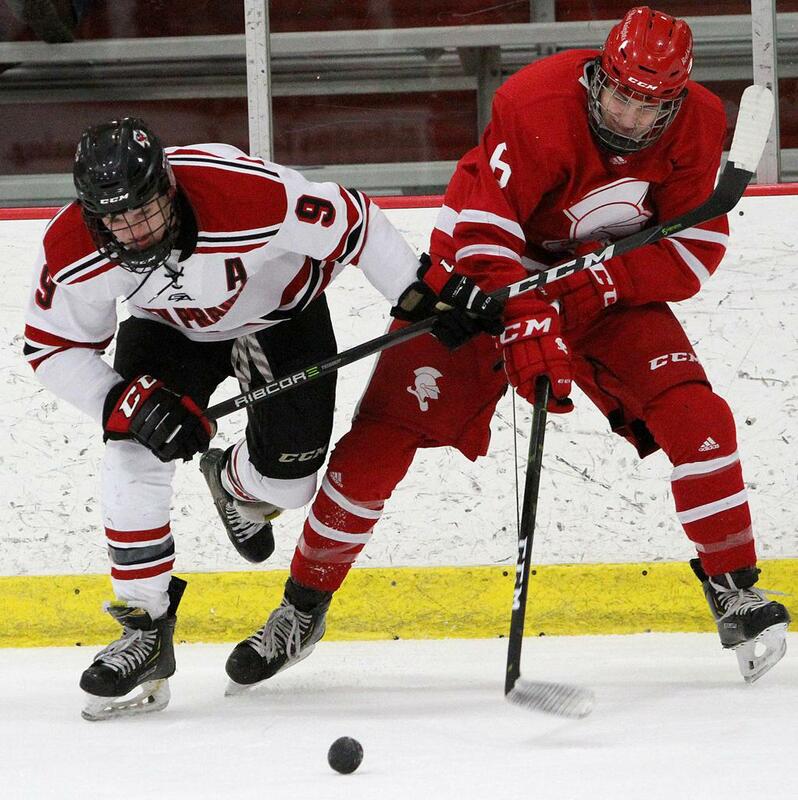 Eden Prairie (13-8-2, 2-3-0) also got goals from Sam Wilhite and Keegan Langefels in the win. Benilde-St. Margaret's (15-6-0, 3-1-0) saw its five-game winning streak snapped, despite third-period goals by Blake Mesenberg and Charlie Bischel just 11 seconds apart. Axel Rosenlund finished with 24 saves for the Eagles, while Carson Limesand stopped 28 shots for the No. 8-2A Red Knights.